Don't forget to leave us a comment with a link to your card, so we can come by and admire all your pointedly, prickly creations !! PS: just a little note re the Scrapbook Outlet sponsored dare...the lucky winner will be announced very soon, so sorry for the delay. The Flowers That Bloom In The Spring, Tra, La. Big thanks to everyone who took part in my first dare on Friday. The team were amazed at the diverse array of cards you came up with and we hope that our cards helped to give you some inspiration. I’m sure you’ll be pleased to know that the team also gain lots of inspiration from your creations too, so keep those cards coming because we love seeing them all. Our midweek Little Extra is titled ‘The Flowers That Bloom In The Spring’ and we would like you to create a card with flowers. Simple? Aww but hold on…….there’s a little twist because we don’t want to make it too easy for you. We want your cards to have flowers on but we don’t want to see any Prima’s or shop brought blooms. The idea of this dare is for you create your flowers yourself, so let’s see what you can come up with. Once again, the team have been amazed by how many of you have taken part in Fridays Teen Spirit dare and also the Easter Little Extra on Tuesday. We love seeing all your creations so keep them coming. This week the girls have let me (Sue) loose on my maiden dare so I hope I’ve come up with something you can all play along with. Tiddlywinks, playing cards, dominos, jig saw pieces…….the list goes on and I’m sure that most of us have a drawer somewhere that has the odd one or two of these lying around in. Well now’s your chance to use them because I dare you to make a card using some of those pieces. Oh and no, you don’t need to throw a double six to start playing. Don't forget to leave us a comment with your blog link to show us what you come up with. 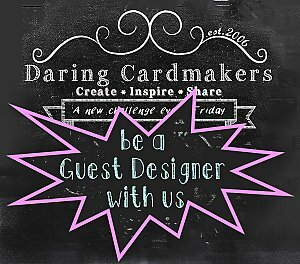 If you haven't got a blog don't worry you can still join in, send a photo or scan of your card to the team at daringcardmakers@hotmail.co.uk and we will add it to our gallery and share the link right here on the blog. Here's some cards from the design team to help inspire you. Hello again everyone !! A huge thank you once again to everyone who has taken part in Rachel's 'Teen spirit' dare. We have a great response so far- and dont forget - you still have time to get a card in for the Teen dare- and be in with a chance to get the random spot prize, generously supplied by Scrapbook Outlet NZ. Now, on to this weeks mid week dare. Its a nice simple one, happily, and all you have to do is make an Easter card ! We have purposely kept the little extra simple because its Sue's first time to dare on Friday - and she has a really tricky challenge lined up for you !! (evil laugh here). We are lucky to have Fiona Carter still with us as Guest Designer and our newest guest designer is Tanya Leigh ! Welcome Tanya, we are looking forward to working with you and continuing working with Fiona. Okay, here is some Easter cards from the team to give you some starting ideas....cards designed by Tanya (Guest designer), Lythan,Keryn, Kathy and Sue. Thank you girls !! Thank you all once again for sharing all your beautiful creations with us. We have so much fun looking at them all. Thank You Mel for setting some awesome dares to challenge us. "Well I thought we have had plenty of flowers and hearts and girly things so I would like some cards with some teen spirit please." Quite a first challenge ! Thanks Rachel ! BUT WAIT ! There's more ! This week we are really happy to be able to offer a random Spot Prize to one of our lucky darers, very kindly donated by Scrapbook Outlet NZ ! !Now, you need to go check outthe beautiful goodies for sale Scrapbook Outlet, you'll be spoiled for choice ! Thank you so much to Andrea and the team at Scrapbook Outlet for your support. The winner will be picked at random next Friday - and will be announced soon after. We'd love to see what you come up with, so leave us a comment- and don't forget to leave a link to your blog so we can all view your lovely work. Here's some from the design team to get you started. The mid week dare this week is another one by Mel - these are a few of my favourite things. What you need to do is use one of Mel's favourite things on your card (embroidery cotton/thread, buttons, felt or fabric) and combine it with one of your favourite things. Here are a few cards that the Design Team whipped to get you started :)))Card are from Mel, Fiona, Jane, Jo and Rachel . Don't forget to leave a message with a link to your blog ! Thanks again ! The dare involves creating a card incorporating a tea bag or coffee satchel - just perfect for days when somebody may need a quiet rest and break. I'm really looking forward to seeing what you all create for the dare. Also, thankyou so much for participating in the mid week stitching tutorial. There were some really beautiful cards created! Hello, it's Mel here this week to show you all how easy and effective a little hand stitching can be on your work. Hand stitching doesn't have to be long and complicated to achieve a really lovely finish on your cards. Sometimes even a tiny bit of cross stitch here and there is a nice way to add an extra element of 'handmade'. To begin you will need some basic supplies - needle, cotton/embroidery thread, scissors, ruler (handy for measuring spaces or helping with straight lines), pencil and eraser. I tend to use stranded embroidery thread for handstitching but you can even use machine cotton if you are stuck - it just gives a thinner appearance when stitched on the card. If you are using stranded embroidery thread you can vary the strands for a different thickness....mostly I use 2 or 3 strands but if you really want the embroidery to 'pop' try using the entire 6 strands. Start by working out your design. You might decide to just stitch a straight line on your card or perhaps draw around a template (circles, stars etc..). The possibilities are endless. Use your pencil (and ruler if you aren't using a template) to draw/measure the area that you wish to stitch. Now pin prick holes with a pin or needle directly onto the card. Use an eraser to rub out any pencil lines. Thread your needle and begin stitching through the the pin pricked holes. Adhere the start of the thread using double sided tape or a photo tab. Once the design is finished you can adhere the last piece of thread into position using another photo tab or piece of double sided tape. Thankyou also to all the fabulous 'I am woman' cards from Lythan's Friday dare. WOW, there were some really beautiful cards created by you all for the dare. Thanks so much for joining in and having a play. Well, have fun stitching and we can't wait to see all your gorgeous creations for this week's mid week dare.